Dynamic frequency selection is a technology that is designed to ensure that wireless devices operating in the unlicensed WLAN 5 GHz bands are able to detect when they may be interfering with military and weather radar systems and automatically switch over to another frequency where they will not cause any disturbance. These formal requirements are in effect in the USA, Canada, Europe, Japan, Australia, Korea and other markets around the world. A master device is any device — such as, for example, an access point — that features radar detection and has the ability to control other individual components in a coordinated system. 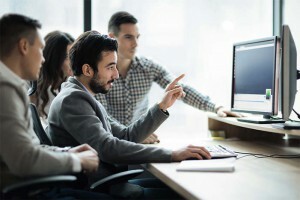 A client device requires authorization to initiate communications on a channel — routers and laptop Wi-Fi cards that do not support ad-hoc connectivity are considered client devices. NTS is authorized to provide testing and certification of a wide range of devices employing dynamic frequency selection technology. To discuss the specific requirements of your project with one of our engineers, contact an NTS testing lab near you. Channel availability check time, or CAC, which is the length of time a system is required to monitor a channel for other devices before initiating a communications link. Interference detection threshold, which refers to the minimum signal level that must be present before the system is triggered to move to another channel. Interference detection threshold is calculated based on a 0dBi antenna. Channel move time, which is the maximum amount of time — measured from the end of the radar burst to the final transmission — the system may take to clear a channel once an interfering signal is detected. Channel closing transmission time,which is amount of time in total a system spends transmitting during a channel move. Non-occupancy timeis the length of time following the detection of radar on a channel in which that channel may not be used. A random channel selection to distribute a signal evenly over the available spectrum. A planned selection mechanism to coordinate the use of a series of devices on a distrusted network. 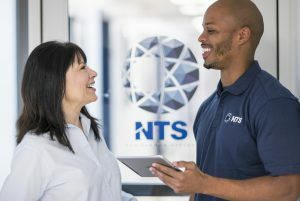 With our expertise in international dynamic frequency selection certification, NTS can develop a testing protocol that ensures you maintain compliance with these and other important factors. NTS is widely acknowledged to be a leading provider of DFS-related compliance testing and certification services. Our experts participated directly in the DFS standards development process with the FCC, Department of Defense, and other industry representatives and we are capable of testing to all current North American, Japanese, Korean and European Union standards for DFS, including the latest versions of the European standard EN 301 893 V1.5.1. Why take chances with less experienced service providers who might lack the true capabilities to ensure that your products will meet these critical new requirements? NTS is your proven provider of fast and reliable DFS testing and certification services!